Agate - Moss - ‘AA’ Grade Tumbled Stone. Moss Agate is a transparent to translucent agate containing inclusions of minerals resembling moss or foliage. It is usually found in massive form. The colour range includes red, green, yellow, brown, and brown-black. 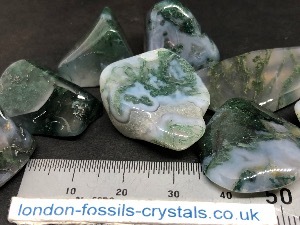 Moss Agate is said to lead one towards the characteristics of agreeability, persuasiveness, strength in all endeavours, and efficacy in all pursuits. It may help to improve ego and self-esteem, providing for emotional balancing and strengthening of the positive personality traits. It's said to allow one to see the beauty within all that ones eyes touch. 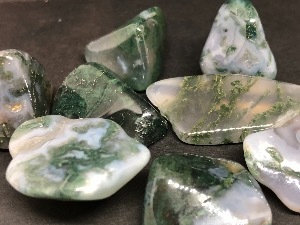 Moss Agate, tumbled to a smooth finish, an ideal pocket size stone, small enough to carry around with you. Tumble Stones can also be placed around the home for their energies or can just be nice decorative items.